Britten: Divine Musick. 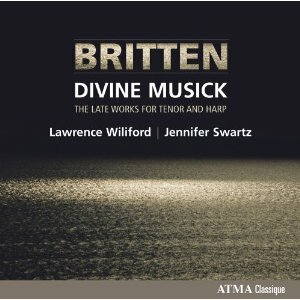 The Late Works for Tenor and Harp | Lawrence Wiliford | Dispeker Artists, Inc.
For his first solo ATMA recording, acclaimed Canadian tenor Lawrence Wiliford sings late works for voice and harp by Benjamin Britten, accompanied by Jennifer Swartz, Principal harpist with Montreal Symphony Orchestra. This CD features vocal pieces by Britten with harp instead of the usual piano accompaniment. The Five Songs from Harmonia Sacra, a collection of 17th-century sacred song, have an intensity which is characteristic for a composer’s late works. This is the first time these works have been recorded with harp. Much more light-hearted are some folk song arrangements. Six of them appear here, and had became a regular part of the unique repertory of legendary tenor Peter Pears and harpist Osian Ellis which this recording commemorates. Nominated by the International Classical Music Awards for Best Vocal Recital CD, 2012.